A tale of betrayal and revenge; a power couple, a congressman and his equally efficient wife work together in order to exact revenge on the people who betrayed them. Where can you stream House of Cards? 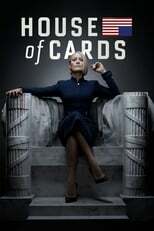 On 2013-02-01 Drama TV Series House of Cards first aired on Netflix. Written and created by Beau Willimon, and produced by Panic Pictures & Media Rights Capital, House of Cards has ended and last broadcasted on 2018-11-02.